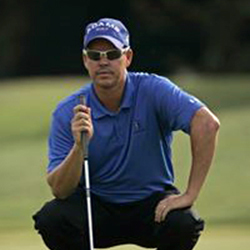 Brad Ott:	Hi, this is Brad Ott, director of instruction here at TPC Craig Ranch McKinney, Texas. I want to talk to you about a little exercise my coach and I used to do when I was playing on tour. It teaches you to react, to be more reactionary in putting. That's a pretty captive word. I want you to consider that word whenever you're putting. A reactive putter is someone who gets over a putt and they're able to assess the line, the speed, very quickly. If they are making a mistake, they can change real quickly. They can adapt, they can overcome and they can adjust. Imagine there's a circle around this hole, a five-foot circle. Just imagine a circle and I've got my balls five foot from the hole. What you're going to do is you're going to putt around this circle. You're going to go all the way around. Again, imagine this is the top of the hole at 12 o'clock. You're trying to go all the way around the clock back to 12 o'clock. What you need to understand is each putt that you putt around this hole has a different read and speed. It's up to you to react, to be able to understand which way is it breaking? How much speed do I put on it? How much energy? This will train you to react better. What you're going to do is you're going to set up to the ball and your goal is simply to make putts. We're going to make an example of the first one so you can understand how to play the game. If you make two, let's say you missed the third. Let's say you already missed that one. You stay in your location. If I started here at 12 o'clock, I'd pick all these balls up. I'd move it back to 12 o'clock. If I make all three, what I'll do is I'll go around the clock. My next three will be one, two, three. Now, you don't have to put three on each location. You're basically just working your way around the clock. If your ball stopped here, if you made your third one here, just keep going around the clock. You can decide how tight you want to make it. If you want to keep them real close, it'll just take you a little bit longer. If you make two of the three, you stay in your location. In that case I only made two of three so I would stay right here. You've got to move back a station. If I had made all three right here, my next three would be here and if I made all three there, my next three would be here. I've got to move back one. If I made two of the three, I stay. If I make three of three, I move on. Now, the worst one, and this happens, if you miss all three, start all the way back over. I know this sounds like a little bit tortuous, but what this is going to do, this is going to train you to get over a putt and really see what the break is, what the speed is and how those two tie together. You're going to have to tie in your read and your speed every putt and what that'll do is that'll train you to be reactionary. You should find yourself when you get on the golf course being able to assess a putt and understand it and get the right line and right speed a lot quicker. Hopefully you'll get to where you're making all your putts from around the hole.